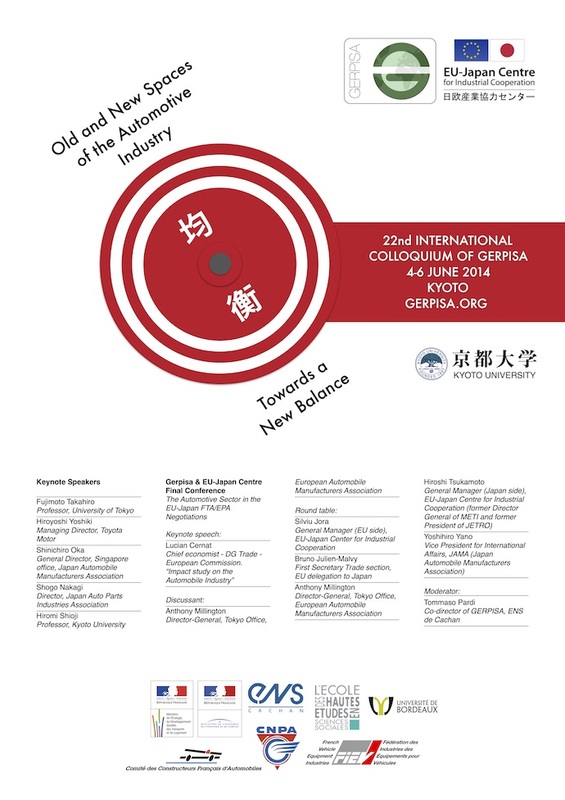 22nd International Colloquium of GERPISA / Old and new spaces of the automotive industry: towards a new balance? Old and new spaces of the automotive industry: towards a new balance? Having put the emphasis on Europe during our two last colloquiums, this year’s colloquium in Kyoto will shed light on the overall tendencies in the Asian automobile industry. Asia appears as the main “driver of change”, in terms of sales and production volumes, and from the point of view of firm strategies, local policies, industrial policies, innovation (technologies, products, organizations), etc. Besides, the main ambition of the 22nd international colloquium of GERPISA is a deepening of our understanding of the restructuring/structuring processes, and their relationships with one another (codeterminations and mutual influences). The reshaping of the international automotive industry since the mid-2000s can not be fully grasped without taking into account these factors, at firm, supra national, national, and regional levels. For instance, it is important to understand that industrial policies in emerging markets can greatly influence local, domestic and international profit strategies of global carmakers and suppliers. It also appears that these trends have a deep impact on the reconfiguration of national automotive industries’ structures and organizations. To that extent, the role of newcomers in the overall restructuring of the industry has to be analyzed from the viewpoint of balance of power. Furthermore, this role not only reconfigures the power relationships within the industry, but also the productive organization and the patterns of transactions at several levels of the industry. From this perspective, the colloquium has for its second main target, from a more theoretical standpoint, the grasping of the interactions between institutions, markets and organizations, and how they relate to the formulation of local and global equilibriums. 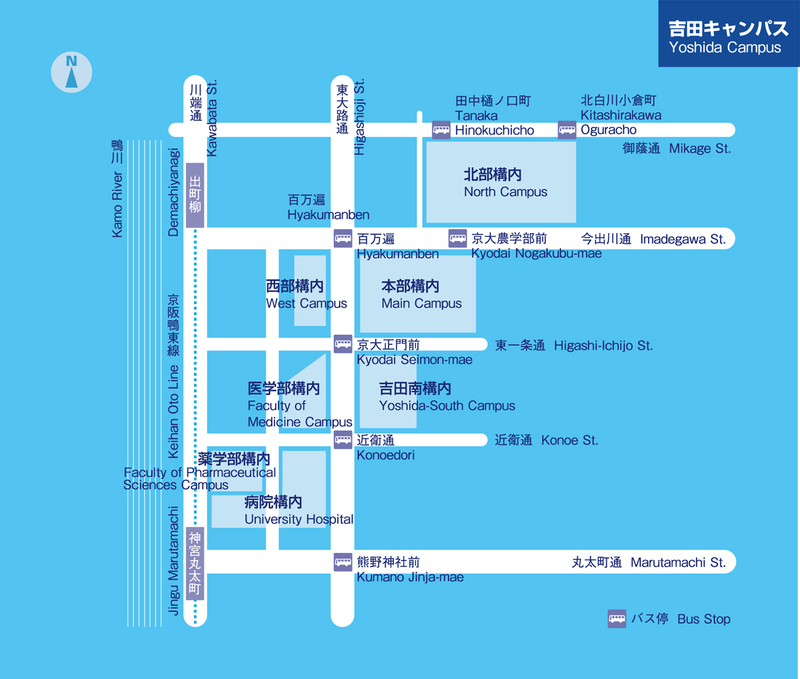 How to get to the Clock Tower, Yoshida (Main) campus? 1. Bus #206 bound for Kitaoji via Higashiyama street. Get off at "Kyodai Seimon-mae" (bus stop in the area 2A of the map below). 220JPY, 38min. 2. Bus #17 bound for Ginkaku-ji via Kawaramachi street. Get off at "Hyakumanben" (bus stop in the area 1A of the map below). 220JPY, 36min. 1. Bus #17 or #3 from 'Shijo-Kawaramachi' to 'Hyakumanben'. 220JPY, 14min. 2. Bus #201 from 'Shijo-Kawaramachi' to 'Kyodai seimon-mae'. 220JPY, 22min.